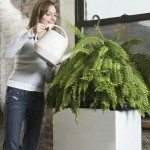 Will a Boston fern grow again if you cut it back at the soil line? Pruning should be done to remove the old fronds or damaged fronds. It is possible for you to prune the entire plant back, but that is not the recommended method.